As a bride, you not only want yourself to look good standing up at the altar, but you want your bridesmaids to look good, and feel comfortable too. Ordering the right bridesmaid dress to suit five or six different girls can be a very complicated task; not only are there thousands of dresses to choose from, but each woman in the bridal party has a different shape for the dress to fit. To have the best possible outcome when selecting a dress, take factors such as cost, design, and reuse into consideration, and be sympathetic to your bridesmaids needs. Remain open to suggestion, but know that you will be the one to make the final decision on the dress, so be decisive when your bridesmaids look to you for the final say. One fear of many brides is to be the ‘friend that chose the most hideous bridesmaid dresses.’ Many dresses from the late eighties and early nineties have brides from those eras cringing at their choices. What will always be stylish are the simple yet elegant, streamline dresses that are neither to frilly nor too lacy; currently, A-line gowns offer that choice for bridal attendants. If you are afraid that you are going to pick out an ugly dress, ask a few bridesmaids to go with you to help with the decision, or look at dresses online, send links to your friends via email, and poll them on their favorite style. Or, for a hands-off approach to selecting a dress, just pick a dress color and length, and tell your bridesmaids to select their own dresses within your general guidelines (this would work best for colors such as black or champagne, but may not work well with colors like pink that have a broad spectrum of shades). Black is a classic bridesmaid dress color, and neutrals like taupe and sand are popular as well. Neutral colors have a timeless look, so if you’re worried about choosing a ‘dated’ dress, opt for neutral shade. Deeper colors like burgundy, purple, or hunter green are suitable for fall, whereas paler shades like light yellow, lilac, or soft pink are fitting for spring. When choosing a color, think about the skin tone and hair color of your bridesmaids, and try to pick a color that would be universally flattering. While it may be tough to find a color that will look great on everyone, you certainly do not want your pale-skinned, blonde friend to wear a pale yellow dress she’ll be completely washed out! Selecting a dress that is, at the very least, flattering, will help your bridesmaids cope with the money that they will most likely be spending on the dress. With weddings costing more than ever, many couples are unable to afford to pay for the attire of their attendants, so bridesmaids and groomsmen are left to foot the bill for dresses and tuxedos. It is now common practice for the attendants to pay for their own attire, but this does not mean that financial help goes unappreciated. The cost of a dress, shoes, shower gifts, wedding gifts, airfare, and hotel rooms can become outrageous for a bridesmaid, so if you can, try to help with some of the expenses. Some brides, instead of paying for the bridesmaid dresses, will pick up the hotel bill for the bridal party members. Others will split the cost of the dresses. Make sure to order the dresses around six months in advance to allow ample time for delivery and dress alterations. 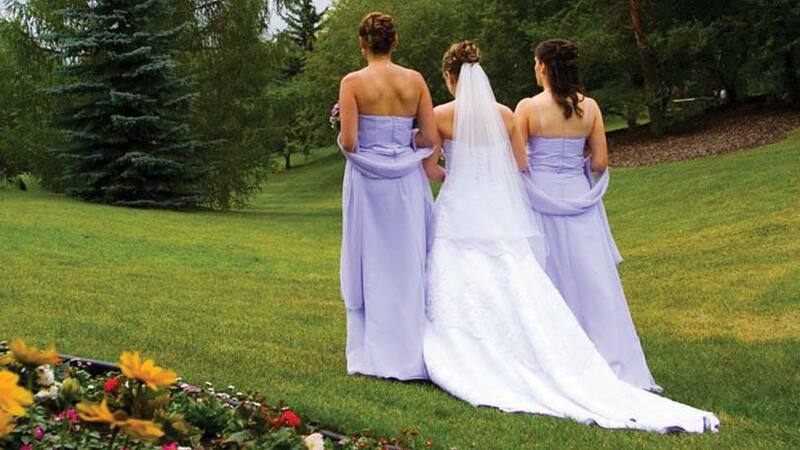 Some brides make an extra effort to select a bridesmaid dress or outfit that will be reusable in the future. For a less formal wedding, a long skirt and sweater makes a great bridesmaid outfit, and the mix-and-match pieces can later be integrated into the maid’s wardrobe. Simple dresses can usually be worn again more often than sequined or embellished dresses. For the bridesmaids who have a few dresses in the back of their closets and never intend to wear them, take the dresses to a resale shop you may be able to sell them for a bit of cash. There are also places out there where you can donate a bridesmaid dress to be given to low-income high school kids who cannot afford new prom dresses.